As we head up to beautiful Bracebridge today to set up our booth for this weekend's Muskoka Arts & Crafts Show, we are embracing our favourite cottage chic styles! Time spent at the cottage is meant for relaxing, enjoying time with family and friends and embracing the beauty of our beloved Canadian summer. Comfort is key, but you don't have to sacrifice style or practicality in order to be cozy this season. This outfit is perfect for Saturday shopping in Muskoka or drinks Dock-side with friends, but is also fancy enough to wear to dinner at local hot spot, One Fifty Five. 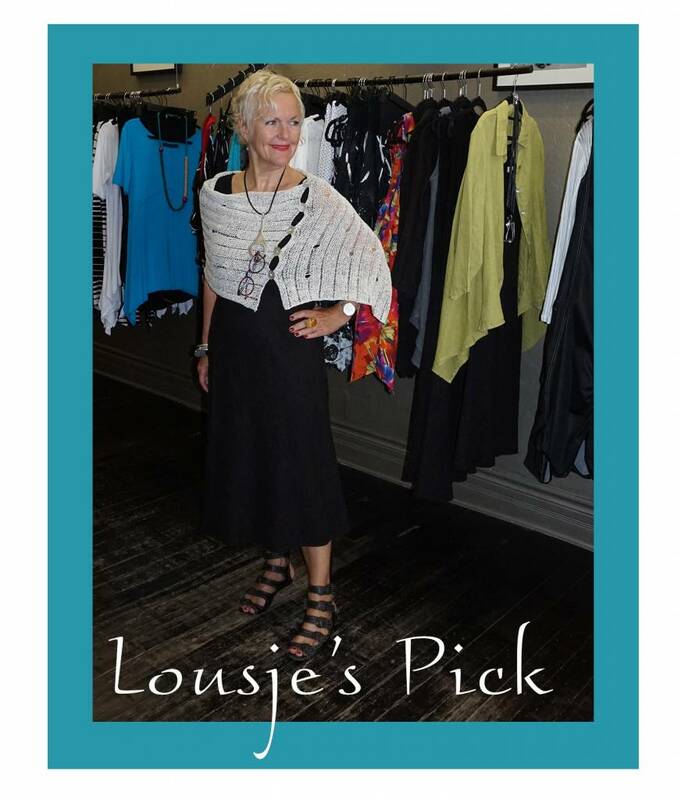 For the ultimate summer style, Lousje has selected this Black Knit Dress from Cut Loose, available in the shop. Sewn and dyed in San Francisco, this wardrobe workhorse is cut to perfection, skimming the body for a flattering and fluid silhouette. Simple to launder and easy to pack, unpack, and wear, this is the perfect piece for a weekend getaway. For those unpredictable northern and lake side breezes, this Cecile Benack hand knit shrug is made in Vancouver and is the perfect layer for both coverage and style. To accessorize this look, Lousje has added one of her favourite necklaces in the shop. The pendant hangs on leather rope and is both stylish and smart as it is also designed to hold your glasses - an amazing feature for those of us who can never seem to remember where we set them down last! If you're in cottage country this weekend, stop by and see us at the Muskoka Arts & Crafts show and tell us all about your favourite comfy cottage chic pieces. Alternatively, if you are stuck at home but want to embrace this summer style, drop by the shop and check out some of these fabulous pieces! Happy weekend, friends!